It is always wise to use caution when trading on the binary options market. Especially these days with so many new trading systems on the internet trying on entice us with claims of huge profits for a minimal investment. The Secret Millionaires Club 2016 is trying to entice traders with big promises. In the introductory video on their sales page, they claim that even those with no prior experience with binary options can earn millions of dollars. 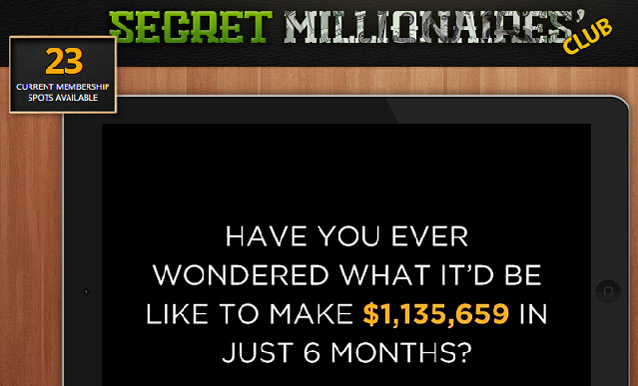 According to their sales video, this novice trader earned almost 1.5 million dollars in just six months of trading with the Secret Millionaire Club 2016 software. Sam Johnson, CEO and founder of the Secret Millionaires Club, claims there is no charge for this system. However, anyone with any experience or knowledge about binary options trading knows that this is not true. Once you create an account with any trading system, you must make a deposit with that system before you can begin trading. Johnson goes on to say that Secret Millionaire Club 2016 has a 100% success rate and has not lost a trade. Anytime anyone makes such a claim, which is an obvious sign that the system is fake because no binary options trading platform can ever produce 100% profits. Binary options is a risk and will never produce 100% profit returns, no matter what anyone tries to tell you. In fact, as of this writing, we have no substantial proof that anyone has actually profited with this trading system. Also we could not get a hold of their customer support team, so we have even more reason to believe that this is not a legitimate trading system. The Secret Millionaire Club 2016 is completely run on autopilot and supposedly generates guarantee signals for traders to achieve huge profits. However, the majority of reviews we have seen about the system show that traders ended up losing their entire investment rather than earning profits. There have been numerous complaints online regarding this trading software. Due to the lack of unbiased and positive reviews, we cannot in good faith recommend The Secret Millionaires Club 2016 for those who are serious about binary options trading. There are just too many red flags. The fact that we could not find a way to contact customer support was disturbing to us. Also the fact that traders are losing their money and not profiting at all with this system leaves a bad taste in our mouths. We strongly recommend that you find a more trusted trading system and avoid scams like the Secret Millionaires Club 2016 at all costs. 7 Binary Options review: Secret Millionaires Club 2016: 1 stars.